Gloucester are to take action against Sale for allegedly approaching Bryan Redpath while he was still head coach of the Cherry and Whites. Redpath was linked with a move to Sale before he quit Kingsholm in April. He has since been appointed director of rugby with the Sharks, although the club strenuously deny making an approach while he was under contract. Managing director Ken Nottage confirmed to BBC Gloucestershire they were consulting Premier Rugby on the matter. "If we find evidence to increase our suspicions that Sale have manufactured this we'll fight back with a no holds barred legal attack"
"I think it's the right thing to do and there are people in the club who feel strongly about this," said Nottage. "Just to say, 'That's fine - that's sport' is not right. Our fans would agree with us on that. "There is a code of conduct that all 12 [Premiership] clubs signed up to, and that deals with illegal approaches. "We're going to talk to Premier Rugby and see if there has been a breach of conduct and take their advice on how we handle it." Sale had been searching for a new boss following the departure of Tony Hanks in March and Redpath - a former Sharks player - was favourite from the outset. The Scotsman was under contract at Gloucester until 2014 but resigned with two games of the regular season left to play, blaming their poor run of form for his departure. At the time, co-owner Ryan Walkinshaw took to Twitter to vent his frustrations at Redpath's exit, stating: "If we find evidence to increase our suspicions that Sale have manufactured this we'll fight back with a no-holds barred legal attack." Gloucester have since appointed Scarlets' Nigel Davies as head coach, while Redpath was unveiled on 1 June. 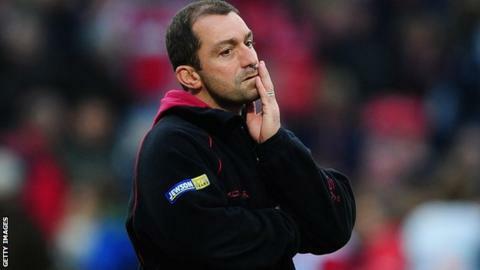 Speaking to BBC Radio Manchester, Redpath denied he received an approach and reiterated that it was merely "the right time to step aside" at Kingsholm. But Nottage believes Sale have a case to answer to: "There is an issue here and it does need to be bottomed out. "I think it will be very difficult to prove the breach. We can all speculate whether there was or there wasn't. "Proving it will take time and effort and I think that's what Premier Rugby should help us with."